Alright, so you have your document written out –but you don’t like the way it looks. No problem! 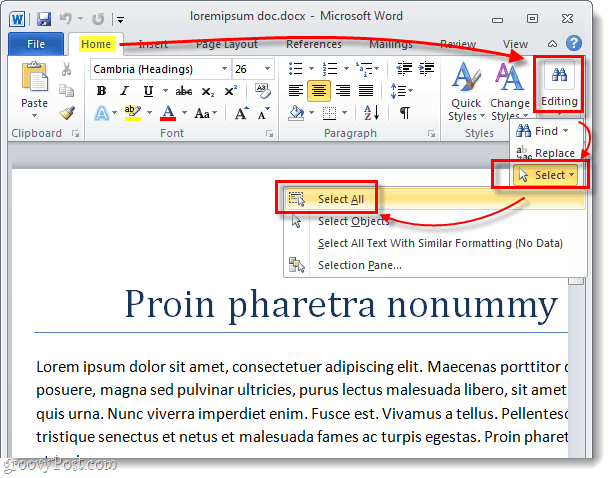 Changing the font of the entire document in Microsoft Word is easy and can be done in a few simple steps. If you are using Open Office, Google Docs, or another alternative: the process is very similar. Once you learn how to do it with one word processing program, you can pretty much do it in all of them! Alright, spruce up your documents by changing the font around. Let’s get started! The first part is easy, all we need to do is Select all of the text in the document. To do this Press Ctrl + A on your keyboard. Or, if you don’t like using keyboard shortcuts, go to the Home ribbon and Click Editing > Select > Select All. 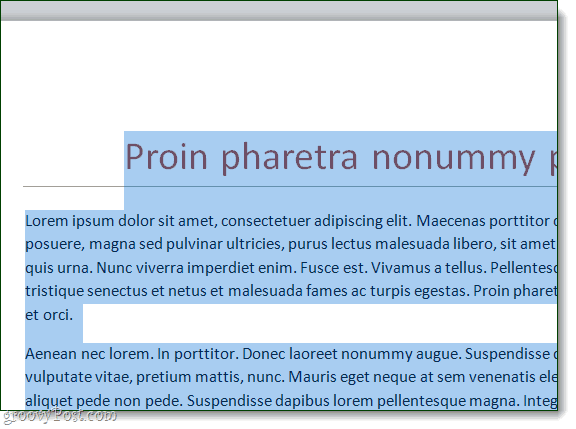 All of the text in your document should now be selected and highlighted. With this done, we can edit the entire document at once! On the Home ribbon you’ll find everything you need under the Font heading. Click the wide font box to display a list of fonts. From this list you can hover the mouse over a font to preview it, or Click it to change the text to that font. You can also adjust boldness, italics, color, size. and underline. But, this manually adjusting all of these things might not be the easiest or the fastest way to make your document look great. The first thing you should try, is styles; I’ll show you where they are below. Alternatively you can use the Styles menu to Select some pre-made font sets. 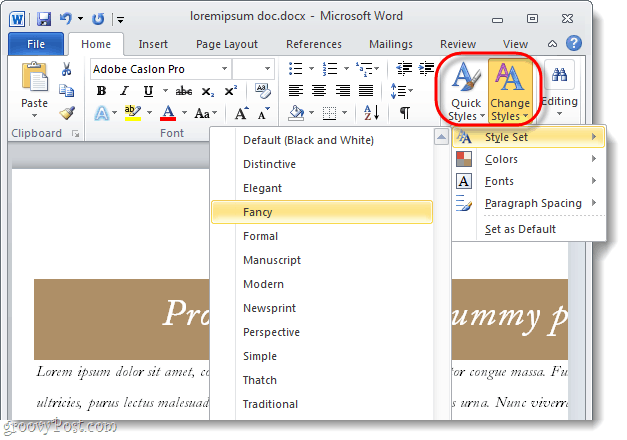 A style will automatically adjust the color and font of your document. It also applies different values to headings, titles, and other special text. With a pre-made style you can change the look of your entire document to something professional and appropriate in a single click of the mouse. I have been doing this for as long as I’ve used MS Word (since the 1980s). However, I can’t seem to make it so that font I’ve assigned sticks. First, after having selected all, applied the font size and type (in this case Ariel 10), and saved, when I select all again, I see that the Font window shows a blank instead of showing the font I used. I take this to mean that somewhere in the document, it’s not Ariel 10. Second, in the middle of moving things around, sure enough some other font starts appearing. It often happens when I get rid of a paragraph marker, so I think it’s somewhere in the paragraph-level formatting. Is there a way to do the select-all/format/save thing (meme? riff?) such that Word knows that I really mean it? I was having the same issue as David above where the font I selected did not stick and the fonts section stayed blank. I am aware it is a few years on since the question was posted but I thought the answer would benefit someone else as I found a solution which worked for me. Select the all the text requiring font change – Go to the Toolbar – Select format – Go to Font – Change the font. same problem. This shouldn’t be so difficult. Same problem. 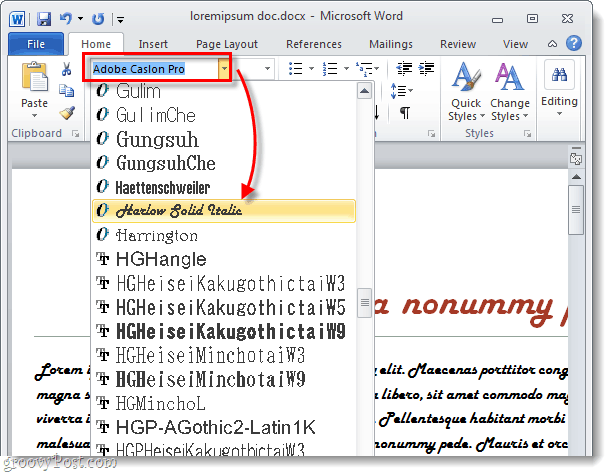 I select the whole document and choose a font – tried this in numerous docx files – but it simply doesn’t work. A mishmash of fonts remains. I’m trying to convert a file to font GENEVA. Can’t find it. Suggestions? This doesn’t change the fonts used in a numbered list. Is there a way to change ALL fonts to a single font, including those in numbered lists? I would like to automatically convert the font of a text that I insert into an existing document. I know how to change the font, but I want to change the size after I have already chosen a letter template. Nothing I am doing is working. Can you help? when i typing in the word 2007 that time work is go on good but I’m close the word file then open the word file font is change and more than spacing leave so how to this problem solve???????????????? please give me the answer……. For several years, once I created a document I would change the font to an “8”. This worked until this morning, 12.23.16 when I noticed that the font has been changed to a “14”. The program will not allow a change from this “14” to an “8”. How can this be done? Yes thats because you need to change NORMAL STYLE in the document which will change all the styles based on it. Including headers and footers.